Hope you’re all enjoying your week – Unfortunately I’m ill with a cold so I’m drinking fluids like no tomorrow and I’m trying to rest up as much as I can. 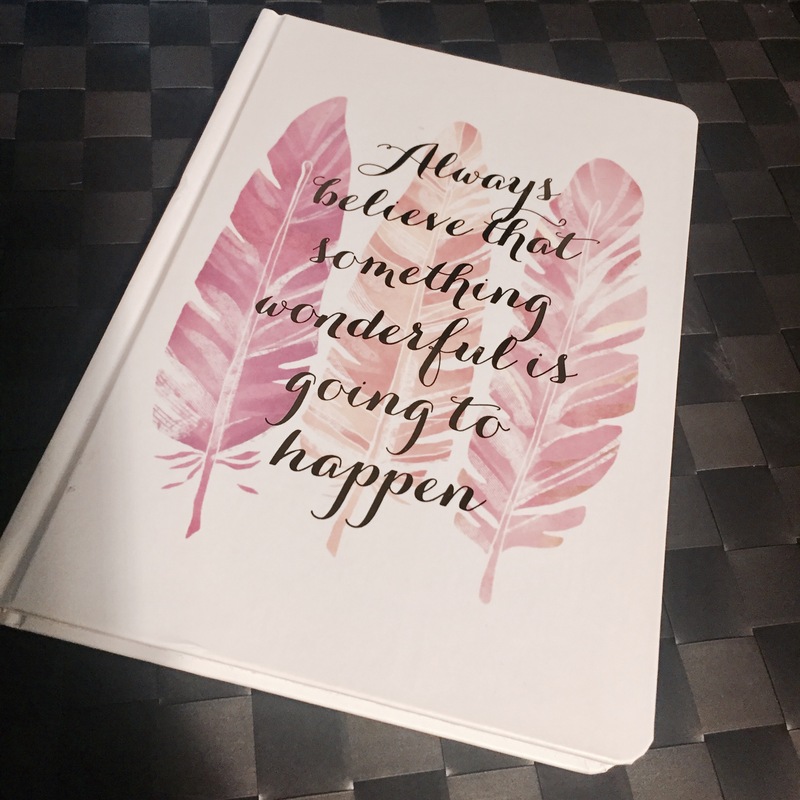 As well as that, I have finally pulled out a beautiful little notebook I purchased a while back but never really felt I could write in it as I wasn’t sure what to do with it. This morning while resting on my sofa with a green tea, I decided I finally had the topic for it. I’d love to earn some more money and I’ve seen my friends on Facebook getting involved with sideline projects and promoting the brands they’re working in conjunction with. I watch youtube vloggers like this beauty that have their fingers in loads of pies and I wonder to myself – HOW THE HELL DO THEY DO IT? As I pulled the pretty little notebook out, I wondered to myself, why is it we love stationery so much? Why are we addicted to purchasing those gorgeous little notebooks and fancy pens and beautiful stickers and labels and diaries so much? Part of me things that when I write, I place down part of my soul. My writing is as unique as my fingerprint, it reveals something about myself. I want my writing to be perfect – I can’t stand to see my writing turn to rushed scrawls that are barely legible. My writing is my stamp; my mark on the world. It reveals more of myself than any typed word could ever do. I sometimes think my writing is not fancy or neat or I don’t have such interesting things to write about in some intimidatingly beautiful notebooks. Some notebooks look to me like they intend to hold manuscripts, rather than Christmas wish lists or scribbled notes from a meeting. I feel I do not hold a manuscript in me, so I pass over those fancy notebooks. I wouldn’t want to spoil such a perfect notebook with my jumbled thoughts. Obviously I need to change my opinion on that, but at the moment, I feel there are “purposeful” notebooks, and “everyday catch all” notebooks. To me, writing is nostalgic. When I receive a handwritten note, I know the person has gone out of their way to take time out of their busy schedule to purposely write to me. And that makes me feel so special, especially as we live in a world where we are typing our “I love you”‘s on our iPhones while running around the supermarket or out at a bar with friends (which is a pet peeve of mine, apart from to take a photo, I generally leave my phone in my bag during social events). I’m a dreamer and can be rather whimsical at times, old fashioned even. I hear about a time when things went at a much slower pace, that news didn’t get plastered everywhere until a day or two later, and in some cases, even longer. Sometimes I love the convenience of technology but I love the luxury of the written word. Case in point; the man I have been seeing for a fair few months now lives maybe 70 miles away from me. Even though its perhaps 1 hour on the train (not including travelling to the station and waiting for the next train). We see each other every other weekend usually. When we are not seeing each other, we use WhatsApp to communicate usually on a daily basis. It’s perfect for general messaging, screen shotting our travel information to each other so we know when our trains are arriving to meet each other at the station, pasting links to events or bars or restaurants to organise our visits together, creating groups to organise a larger group get together, recording and sending little voice or video messages to say “Buenos Dias!” (he’s Spanish) first thing in the morning, to send little silly photo’s throughout the day to ease the stressful working day… and I like to utilise technology to take photo’s of little post it notes I scribble little notes on for him, or send a photo of a steamed up mirror after I’ve just taken a shower with a little silly note on there for him. 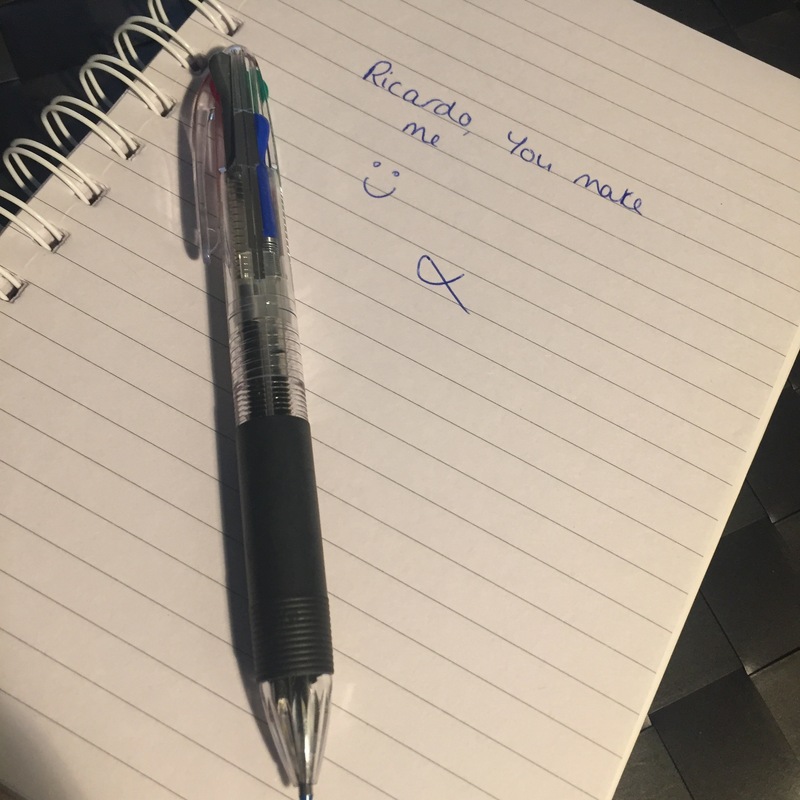 Sometimes I write a letter to him and scan it into my mac, and send it over on e-mail to him so that it has that handwritten look still but with the convenience of technology. So yes, dust off that old pen and write your aunt a thank you note or draft your lover a sonnet, it’s more appreciated than you may realise!